Our casual dining atmosphere is perfect for relaxing. 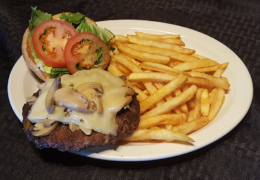 We serve great food at great prices, with plenty of parking in our private lot. 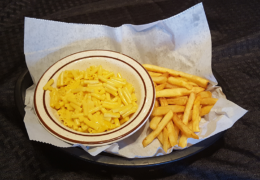 Feel free to order Carry-Out by calling, or by ordering while at our Bar or Cabins. 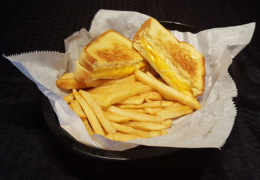 Select our Menu Pages below and browse through all our Items and Descriptions. 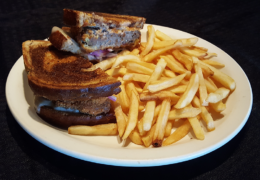 See a slide show of all our Entrees in Gallery! 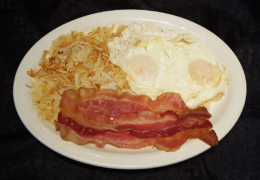 Start your day off with home cooking for the whole family! 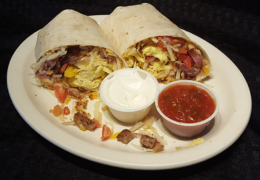 Served Saturday and Sunday, 9am-Noon. All breakfast entrees served with toast. 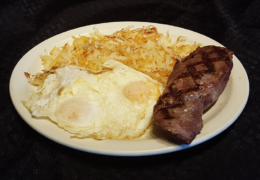 Your choice of Sausage/Bacon/Ham, with 2 Eggs any style, Hashbrowns, and Toast. 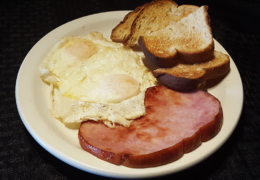 Your choice of Sausage/Bacon/Ham, with 2 Eggs any style, and Toast. 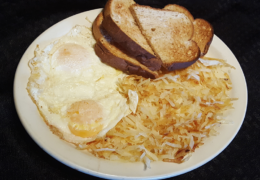 2 Eggs any style, Hashbrowns, and Toast. 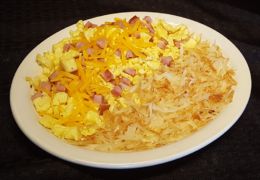 Diced Ham, Scrambled Eggs, Hashbrowns, and Toast. 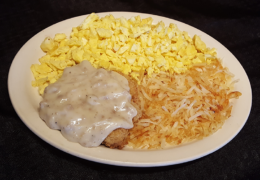 Country Fried Steak, with 2 Eggs any style, Hashbrowns, and Toast. 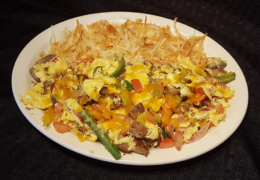 Sausage with 2 Scrambled Eggs topped with Cheddar Cheese, Onion, Green Pepper, Tomato, and Mushroom. Served with a side of Hashbrowns and Toast. Sausage, 2 Scrambled Eggs, Hashbrowns, Onion, Green Pepper, and Cheddar Cheese. Generously rolled-up into a soft tortilla. 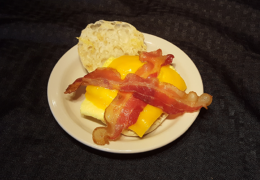 Your choice Ham/Bacon/Sausage, topped with an Egg and Cheddar Cheese, sandwiched inside an English Muffin. 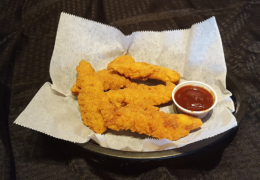 Choose from all our quick and delicious Appetizers to get you started! Additional Sauces and Dressings available for only .25 cents extra. Tasty tots cooked to perfection. Bolder, bigger and more flavorful than the average Pizza Roll! 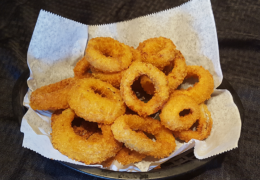 Generous Basket of Onion Rings! Select your favorite: BBQ, Buffalo, Sweet Thai Chile, Jerk, or Plain. Comes with dipping sauce. Choose your favorite flavor: BBQ, Sweet Thai Chile, Jerk, or Plain. 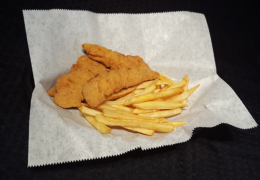 Served with dipping sauce. Your choice of Chicken or Beef. 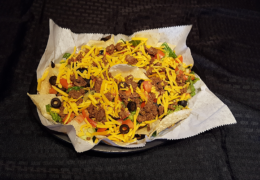 Comes loaded with Cheddar Cheese, Black Olives, Jalapenos, with sides of Salsa and Sour Cream. 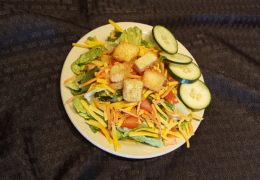 Our House Salad generously topped with Cheddar Cheese, Carrot, Tomato, Cucumber, and Garlic Croutons. 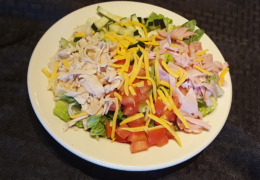 Fresh made and topped with Ham, Turkey, shredded Cheddar Cheese, Tomato, and Cucumber. 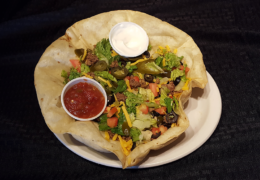 Incredibly delicious Taco Salad featuring a deep-filled crust of Taco Meat, shredded Cheddar Cheese, Black Olive, Jalapeno, and Tomato. 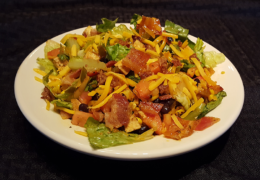 Spicy Chicken Santa Fe Salad beginning with fresh chopped Romaine Lettuce, topped with tender Grilled Chicken, Black Bean/Corn/Onion Relish, Shredded Cheddar Cheese, and Bacon, mixed with Pico de Gallo. Served with a side of Homemade Boarder Dressing. 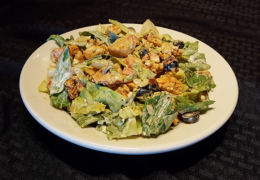 Chicken Caesar Salad featuring a delightful combination of tender Grilled Chicken, crispy Romaine lettuce, Parmesan Cheese, Tomato, and Garlic Croutons, tossed in our Creamy Caesar Dressing. 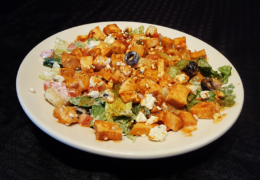 A spicy combination of sliced Buffalo Chicken, crumbled Blue Cheese, Tomato, Olive, Croutons, and crispy Romaine Lettuce, tossed together in Blue Cheese Dressing. 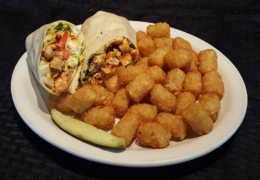 Buffalo Chicken Wrap in soft tortilla. 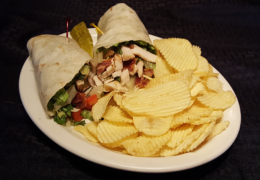 Chicken BLT Wrap in soft tortilla, stuffed with tender Grilled Chicken, flavorful Bacon, Tomato, Onion and crispy Lettuce. 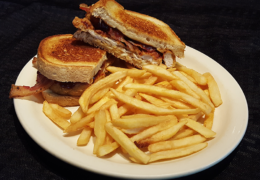 Chicken Tenders topped with Pepper Jack cheese, Bacon and BBQ sauce grilled to perfection. Served on Sourdough bread. 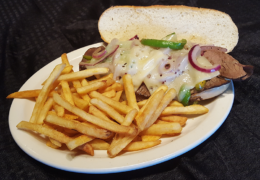 Generously piled on Beef or Chicken Philly Meat seasoned with sauteed onions and peppers. 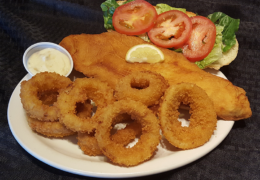 Tender, flavorful breaded Walleye deep fried in a generous proportion and served on a hoagie bun. 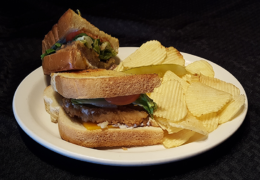 Comes with lettuce, tomatoes, lemon, and tartar sauce. Chicken Fried Steak and American Cheese covered with Sausage Gravy, Lettuce, and Tomato. Served on Sourdough bread. Hearty and delicious! 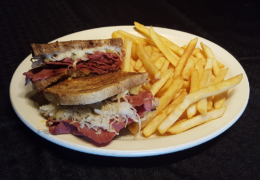 Piled on Corned Beef topped with melted Swiss Cheese, Sauerkraut, and our Special Sauce on Marble Rye. 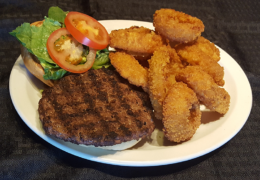 Homemade breaded and deep fried burger with a kick! Served on Marble Rye with Grilled Onions. 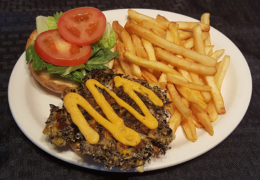 Tasty and hearty for the Wild Rice Lover, or Vegetarian! Deliciously topped with Chipotle Mayo. Juicy 1/2 lb. 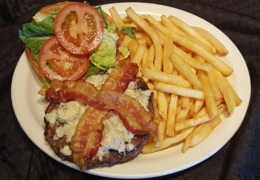 Burger topped with Chunky Blue Cheese, and 2 Strips of meaty Bacon. 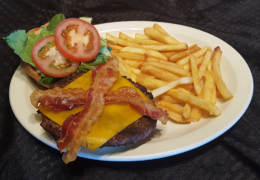 Bacon Cheeseburger – Hearty 1/2 lb. Burger topped with Cheese and Bacon. 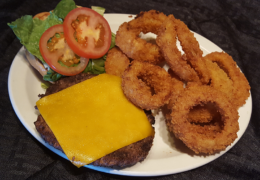 A traditional grilled juicy burger topped with Cheddar Cheese. Hearty, juicy, delicious 1/2 lb. Burger. Flavorful all day long! Big 1/2 lb. 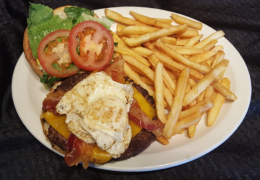 Burger topped with Cheese, Bacon, and Egg Over-Easy. Served Daily. 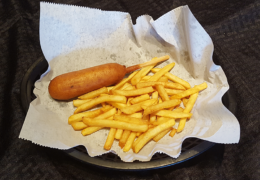 All Classics include: Choice of Baked Potato, Onion Rings, Tater Tots or Cole Slaw. Chicken Fried Steak with Mashed Potatoes, smothered in Sausage Gravy. 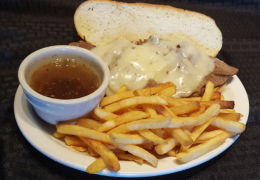 Tender Roast Beef piled high on Texas Toast. Served with Mashed Potatoes and Topped with Gravy. 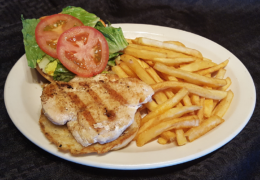 Mixed Peppers, Onions, and Mushrooms grilled and tossed with Grilled Chicken Breast in a Sweet and Tangy sauce. 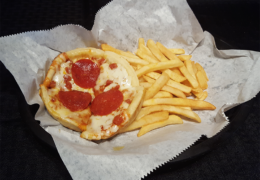 Try our new Fire House Pizza. Thin and Crispy, Handmade in Minneapolis! 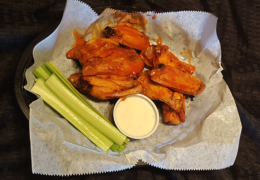 Exciting flavors and topping combinations, including: Pepperoni, Pepperoni & Sausage, Chicken Bacon Ranch, BBQ Chicken, 4 Meat Special and Supreme. 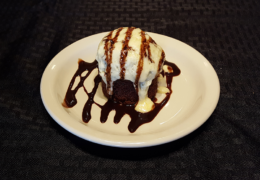 Chocolate Lava Cake dripping with icing and fudge. Refresh yourself with a cold or hot beverage. Free Refills on Coke products! Including Coke, Diet Coke, Sprite, Mr. Pibb and Mellow Yellow. Your choice of Orange, Pineapple, or Grapefruit Juice. Choose from 2% or Chocolate. Perfect for anytime, day or night! Brewed fresh. By the cup including refills. Tonic Water, for a little fizz. 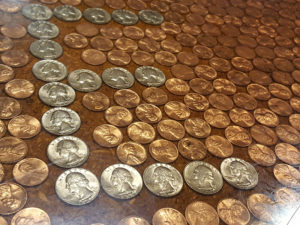 10 Taps to choose from including light, red, and dark beer in popular and craft varieties. 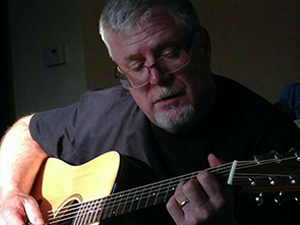 Enjoy your favorite or try something new! EVERY SATURDAY 11AM-3PM. Create-Your-Own the way you like. Our Bloody Mary Bar includes olives, pickles, green-red-yellow peppers, cucumbers, celery, lemon, lime, and even Old World Meats beef sticks! 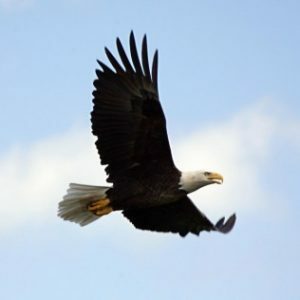 For a relaxing getaway right on the lake, come to Eagle’s Nest Resort. 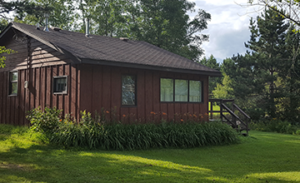 We have five cabins available and boat rentals too. 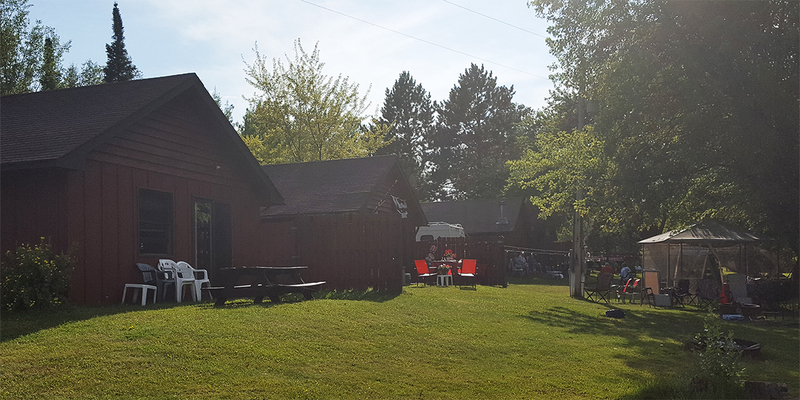 Our restaurant and bar are only a few steps away. It’s fun for the intimate vacation and for time with the whole family! A Great Place to Play ! A Great Place to Stay ! !